This is a fun and simple color, cut and paste paper craft that uses a toilet paper roll as a base to give it a three dimensional effect. 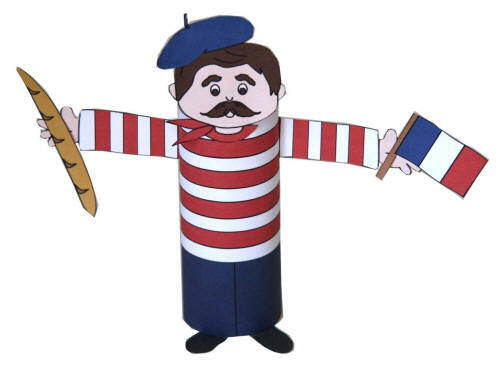 The cute little French boy craft can be used to accompany your Bastille Day celebration or it can be made just for fun. Glue the large rectangular piece around the toilet paper roll. Glue the arms to the sides of the toilet paper roll. Glue the head onto the top of the toilet paper roll. Glue the feet onto the bottom of the toilet paper roll. You can fold the tabs so they stick out of the bottom if you like. Glue the beret onto the head. Glue the baguette into one of the hands and the French flag into the other.